The official sounds of Ezren the Pathfinder RPG Iconic Wizard. Syrinscape is no longer just for Game Masters. Now YOU can punctuate your roleplaying with the arcane incantations of this genius mage. Here the crackle of his lightning bolts, the explosions of his fireballs, and the weird hums and thobs of dozens of other spells. Load up this SoundSet on your personal device and prepare to amaze! 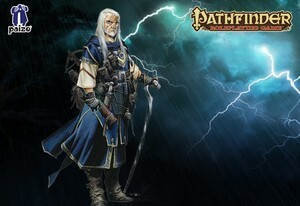 Ezren – Male Wizard SoundSet © 2015 Paizo Inc. Paizo Inc., the Paizo golem logo, Pathfinder, and Pathfinder Adventure Path are trademarks of Paizo Inc. Sounds created under license with Paizo Inc.